Robinson Crusoe was born in the English town of York in the year 1632. He sought a seafarer's life, which contradicted with what his parents wanted him to become. When he was old enough, he broke free of his future of studying law, and embarked on a trading expedition to Africa. During the trip, he learned fundamental survival and sailing skills, which would help him later in life. After the successful first expedition, he embarked on a second one, but was not so lucky. He was captured by Moors, the people of Morocco, and enslaved. However, our resourceful Robinson soon escaped along with another slave and sailed to south America, where Robinson soon started a plantation. The plantation made Crusoe fabulously wealthy, but he wanted more. He embarked on yet another adventure to Africa in order to start trafficking human cargo. But on the way there, he encountered a storm, and became shipwrecked on a caribbean island, with him being the only survivor. Robinson, however, realized that he was very fortunate for someone in his position. He could salvage supplies from the wreck, the island appeared to be uninhabited, and god gave him a chance to “cleanse himself of his sins.” He salvages supplies from the ship, and builds himself a formidable shelter, a cellar, and a pent-house under some grapevines. Over his years, of being there, he perseveres through everything, even through realizing that he may not be alone. But in the end, something happens that will change everything. As I was reading the first page of the book, I was thinking to myself that this book will be a pain to read. And indeed it was, as the language used in that book was renaissance-era english, and the vocabulary was very advanced. The writing was very heavy and dense and in some places even hard to understand. However, other than that, the book was great. The story was a little slow at first, but after about sixty pages, I was greeted with a riveting tale of adventure, shipwrecks, caribbean islands, and the fear of the unknown. A very good job was done by Daniel DeFoe of using figurative language and bible references to describe Crusoe’s situation very vividly. This book is very unique, and overall, I am glad that I chose to read it. I would give this book a nine-and-a-half out of ten stars rating, and I would like to recommend this book to all eighth, ninth, and tenth graders. 1. 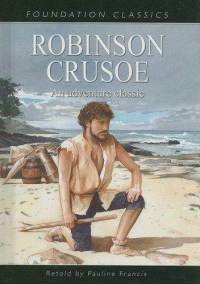 When and where was Robinson Crusoe born? 2. Describe Crusoe’s oldest brother. 3. In what country was Robinson held as a slave and with who did he make his escape? 4. What did Crusoe name the island he was shipwrecked on? 5. What was the weather on November 13th, 1659? 6. What was the first piece of clothing that Crusoe crafted with the animal pelts he was collecting? 7. What caused Crusoe to lose all religious hope? 8. Was Robinson paranoid about attacks from the natives? 9. What triggered Crusoe’s fear of natives living on his island? 10. What did R.C. make candles out of? 11. What did Crusoe name the Spaniard that he rescued from the cannibals? 12. How long was Crusoe on his island? 13. Name the exact date that Crusoe left the island. 14. Why does Robinson choose to return to England by foot? 15. When did Robinson depart for the East Indies as a private trader.